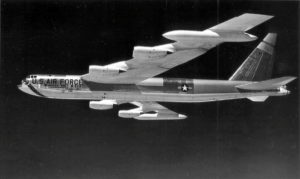 On March 9, 1963, a Boeing B-52 Stratofortress was on a flight from Westover Air Force Base when the escape hatch door beneath Lt. Col. John T. Ertler, the B-52’s Radar Navigator, suddenly blew open and he was sucked out of the aircraft while the plane was at 30,000 feet. Fortunately Lt. Col. Ertler was wearing his parachute and landed in a tree in Springfield where he suffered cuts and a broken arm. The escape hatch came down in the back yard of a private home in Springfield. There were no injuries to the occupants of the home. The escape hatch measured about 3ft by 5 ft. It reportedly came down in the yard of 37 Linden Street which is directly across from Sacred Heart School where classes were in session at the time. An air force helicopter was able to land in the back yard of 51 Cunningham Street to take the injured flyer to the hospital.